Prof. Mark Hauber featured in Nautilus Article: How Birds Spot a Fraud and Choose the Right Gender for a Mate. Hauber lab research featured in Audubon article: "How Does a Cowbird Learn to be a Cowbird?" Prof. Mark Hauber featured on Research Foundation CUNY's "Research in a Minute"
Hauber Lab featured in The Washington Post article: 3-D printed eggs show how birds react to impostors in the nest. Science In Brief (28 May 2015) Robin mom fooled by fake egg. Science 348: 950 Link here! Dr Zak Aidala graduates with a PhD in Biopsychology from GC CUNY on May 27, 2015. Congrats Dr Aidala!! Prof. Hauber featured in NPR article on the lab's 3D printing project! Read the article here. Hauber lab study cited in NewScientist article on the color of dinosaur eggs. Prof. Hauber inerviewed for "Devious Way Birds Fight Egg Wars" article on BBC website! Research on bird eggs from the Hauber lab and collaborators was featured by the BBC and on Slate.com! Read the BBC article here and the Slate.com article here. Summer student Sophia Carryl was accepted for the PhD program in ecology and evolution at the University of Chicago, to study birds! Good luck, Sophia! PhD student Zak Aidala successfully defended his thesis, with having published all his chapters as peer reviewed papers, and took up a tenure-track job in Psychology at Bloomfield College, NJ. Congrats Zak!! Prof. Hauber quoted by Audubon magazine's feature on all things owl. Former BSc Hons student and current postdoc Dr Brani Igic, at our HFSP collaborator the Shawkey lab, is interviewed about our new paper on tinamou eggs (December 2014)! There was also coverage in the New York Times, quoting both Brani and Prof. Hauber. The Book of Eggs (2014) is highlighted in the New York Times , The Guardian , The Wall Street Journal, and the Chicago Tribune . Fairy-wren embryos, like humans, show evidence of auditory learning; our paper is highlighted by Science magazine (October 2014). Lab alumnus, Dr Matt Rayner, is recruited to be the next Curator in charge of ornithology at the Auckland War Memorial Museum. Congratulations!!! Dr Steve Portugal, now a lecturer at Royal Holloway/University of London, is interviewed by the BBC about our new paper on eggshell pigments acting as sunblock for the avian embryo (July 2014). Congrats to Dr. Beki Croston!! She has started an NSF-funded postdoctoral fellowship with Vladimir Pravosudov at the University of Nevada, Reno (May 2014), to work on chickadees in the Sierra Nevada ranges. Fantastic news and best wishes!! The Book of Eggs is now published (April 2014)!! Available on all continents, through the University of Chicago Press and Ivy Press. Listen to our radio interview with Australian Broadcasters. New research, on the communal foraging strategies of gannets (Animal Cognition), is featured in the New York Times' Observatory section on 12/24/13. Happy holidays everyone! Gini Wohl defended her MA thesis on play behavior in captive sifakas! Great job at the defense seminar (December 4, 2013)! Beki Croston successfully defended her PhD. thesis on egg rejection behavior in robins (November 26, 2013). She has 4 chapters/papers published/in press!! Congratulations! The Book of Eggs, by Mark E. Hauber (author) is now available for pre-sale by the University of Chicago Press (release date: April 15, 2014)! Sept. 19., 2013: Our collaborative work, lead by PhD student Zak Aidala, describes the phylogenetic affiliations of a new avian family in New Zealand; please feel free to read more in this highlight piece by the Australian Geographic. Prof. Hauber was elected to be a fellow of the American Ornithologists' Union (August 2013), and is now editor-in-chief of The Auk: Ornithological Advances . Hunter College and the City of New York will host the 2014 ISBE CONFERENCE in New York City! May 8., 2013: Collaborative research about the role of keeping a tidy nest to detect parasitic eggs is highlighted on the Scientific American's website! Nov. 12., 2012: Prof. Hauber is interviewed by the New York Times , and Canadian Quirks and Quarks , about the recent article in Current Biology on embryonic learning by cuckoo hosts in Australia. Nov. 1., 2012: The Human Frontier Science Program (HFSP) awarded $1.2 million renewal grant to Mark and his collaborators Drs. Matt Shawkey, University of Akron, Tomas Grim, Palacky University, and Geoff Waterhouse, University of Auckland, for their study of thestructuralbasis of egg color diversity in birds. Sept. 24, 2012: We just heard that our NSF Working Group has been funded by theNational Evolutionary Synthesis Center. The project co-leaders are: Prof. Tamra C. Mendelson, University of Maryland - Baltimore County and Rebecca J. Safran, University of Colorado - Boulder. Sept. 21, 2012: Prof. Hauber turns 40 years old! Celebrations are held at: Spin NYC . August 28, 2012: Current Biology accepts the coauthored article: Nature or nurture? Mother to embryo communication results in call similarity and nestling discrimination" by Colombelli-Negrel, Hauber, et al.! July 11, 2012: Prof. Hauber becomes a permanent resident of the USA. In the July 2012 Issue of the Journal of Comparative Physiology A , Prof. Hauber publishes his 150th article with PhD student Zak Aidala as lead author. September 2010. 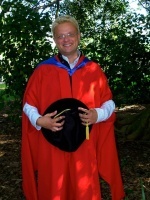 Mark Hauber receives his second doctorate from University of Auckland, New Zealand. Mark Hauber, Ph.D., D.Sc. after the ceremony. Photo: A study showed that while most of the colors of birds' eggshells are visible to humans, UV hues we miss may be important to birds. Credit: Phillip Cassey. Birds see a more colorful world than we do, especially when it comes to their eggs, a new study suggests. Unlike humans, birds can see ultraviolet (UV) light, and they have four - rather than three - color receptors in their eyes, allowing them to better distinguish between hues. Now researchers have shown that while most of the color variation in eggshells can be seen by humans and birds alike, a swath of hues that our eyes miss may play an important role in avian life. For instance, we are oblivious to the UV pigment that may help birds differentiated between their own eggs and those of another species. Among vertebrates, birds are unique in laying eggs with pigmented shells, though scientists suspect the ancestral egg was white and had none of the speckles now common on birds' eggs. The researchers also looked at how the background color of eggshells (the color behind the speckles) varies between bird species from different points on their evolutionary family trees, shedding light on what might have driven the variation in color. The team, led by Phillip Cassey of the University of Birmingham in England, measured the wavelengths of light reflected by 2,190 eggs laid by 251 bird species. The samples came from the Natural History Museum at Tring, United Kingdom. The study focused on background color. "Most of the variability seems to come in the human visible spectrum," said study researcher Mark Hauber, an animal behaviorist at Hunter College of the City University of New York. But the most important variation between species occurred in the short wavelength - or ultraviolet - region of the color spectrum. This may have implications for how birds recognized eggs laid by cuckoos, cow birds and other species who sneak their eggs into nests for other birds to feed at the expense of their own chicks. A Czech study published in 2008 found that Blackcap warblers were significantly more likely to reject other Blackcap eggs after the researchers painted them with an ultraviolet light blocker and put them in nests as a brood parasite would. However, an earlier study found magpies were no more inclined to reject cuckoo eggs coated with a UV blocker. It is believed that birds use color to recognize or disguise their eggs from predators or to mimic the eggs of other birds. Color, including speckles, may also play a structural role, for instance, acting as sunblock for the developing chick or reinforcing the strength of the eggshell. The color comes from two pigments: the blue-green biliverdin, and the red-brown protoporphyrin, which are both breakdown products of hemoglobin. This gives rise to one of the mysteries of egg coloration. "What we don't know is how do these pigments combine, and how do they generate these colors," Hauber said. "You would expect that there are two peaks of color in birds, one is blue and one is reddish, and yet you have these medium wavelengths." The researchers found this "middle" region of the spectrum actually contains the most variation, even between closely related species, indicating that many species-specific adaptations may involve these colors. Meanwhile, they found that the reddish hues are more likely to remain conserved or unchanged throughout evolution among less closely related birds, indicating an evolutionary advantage to this pigment. But, they write, "no single hypothesis is likely to be sufficient to explain the striking variation we observe in eggshell coloration." When ethologist Konrad Lorenz famously raised a flock of geese in the 1930s, they "imprinted" on him, following him around and treating him like their mother. But for so-called "parasitic" animals, growing up with another species is normal. 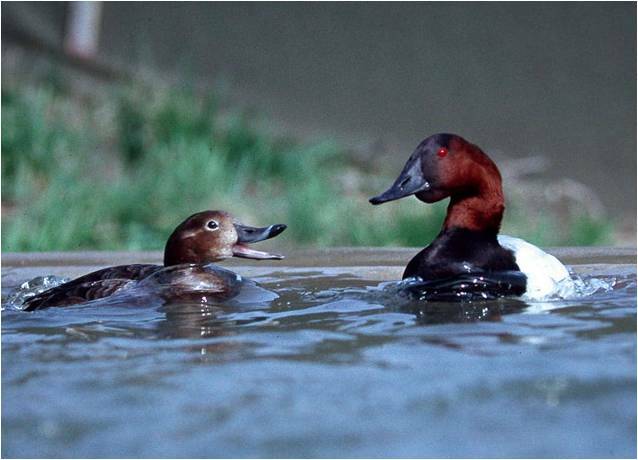 Redhead ducks, for example, frequently lay their eggs in canvasback duck nests to co-opt the other ducks' energy and food for their own young. So how do they avoid the lifelong confusion that plagued Lorenz's geese? They don't, researchers report online tomorrow in theProceedings of the Royal Society B. Scientists swapped ducklings, raising 16 male canvasbacks among redheads and 16 male redheads among canvasbacks, and found that early cross-species imprinting led to courtship chaos for both parasitic and nonparasitic ducks. The canvasback-raised redhead males pursued canvasback females instead of fellow redheads, and redhead-raised canvasbacks (like the male pictured above left) courted redhead females (above right)-and met with hostile rejections. The findings reveal that even parasitic animals aren't safe from the confusion of cross-species imprinting, and leave unanswered the question of how redhead ducks eventually find their way back to their wintering grounds and the company of their own kind. Use of nest box installments by Hunter College students at Black Rock Forest (2010): An update. In May 2010, graduate students enrolled in the Animal Behavior Field Course at Hunter College (CUNY) installed 24 nest boxes along the road near the Stone House at the Black Rock Forest Consortium. Zak Aidala, NSF Graduate Fellow in the Biopsychology Program of the Graduate Center, CUNY, and PhD student in Dr. Mark Hauber's laboratory group, in the Department of Psychology at Hunter College, continues to monitor these nest boxes when the field course is not in session. Our nest boxes are set up in and around 3 separate deer exclosures along the service road (green boxes in attached map). There are 10 boxes at the exclosure closest to the Stone House, 6 at the next one down the road, and 8 inside the exclosure farthest from the Stone House (near White Oak Tree). The most recent visit to the nest boxes on August 10, 2010 proved most exciting. We found evidence of both birds and mammals taking up residence in these new nest boxes. There appears to be a used tree swallow nest, as suggested by the use of feathers in the nest material (see picture) and wren nesting activity, suggested by the filled in twig structures (see picture). We also encountered a flying squirrel nesting in one of our nest boxes (HC 24 at the middle exclosure). The flying squirrel had 2 newborn pups whose eyes were not yet opened. We hope that by next year most of our nest boxes will be home to occupants, which we will continue to monitor throughout the spring and summer. We also hope to install more nest boxes throughout the forest to continue monitoring and assessing breeding diversity and success at these sites. PhD students: I. Novcic, Z. Aidala, B. Croston; instructor: Prof. M. Hauber. Starting in 2010, Master's students in the Animal Behavior and Conservation Concentration of the Psychology Program at Hunter College have the option to satisfy the experimental research methods requirement of their degree by taking Psychology 739: Methods in Animal Behavior. This year the course was taught for the first time by Dr Mark Hauber, ornithologist, animal behaviorist, and conservation faculty member in Department of Psychology at Hunter College, CUNY. f) playback studies of birdsongs to test predictions of the acoustic adaptation hypothesis. h) were also given the opportunity to install a new nestbox colony for attracting and conserving cavity-dwelling wildlife. Four of these components (e, p, g, h) of the course took place during an intensive 2 day field trip at Black Rock Forest Main Lodge and surrounding forest preserve, May 1-2 2010. During this warm and sunny weekend, we were able to observe raptors and resident songbirds, including recently arrived migratory birds. We also inspected nest boxes placed at the site, to discover half-completed nests of Tree Swallows, a brooding Eastern Bluebird, and monitored nesting sites of Eastern Phoebes under the stone bridge and under the eaves of the main lodge (5 eggs, incubating). Surprisingly, the active phoebe nest was not parasitized by Brown-headed Cowbirds, despite a pair of these obligate social parasites foraging nearby on the mowed lawns of the Black Rock Forest facilities. On the second day, students were all given the opportunity to install 2 brand new cedar bluebird boxes each along the Upper Forest track's deer exclosures, with future plans to regularly check on their use given the success of these boxes to house bluebirds, swallows, chickadees, titmice, and other cavity nesting birds. This project is a part of the the doctoral dissertation by Zak Aidala (a graduate of Hunter's ABC Psychology Master's program and current PhD student in Biopsychogy, GC CUNY with Prof. Hauber). The field component of the course exceeded expectations of students and staff as it allowed for a more involved and hands-on experience of research in the field and for students to participate and conduct experimental, observational, and applied (conservation) methods in animal behavior. We thank Prof. Sheila Chase for her leadership in the ABC program, Hunter College's administration for their strong support of the ABC concentration in Psychology, and AEC for providing the funds that made the field trip to Black Rock Forest a reality and a success for the second year in a row.